Family Men Don't Wear Name Brands: Hooray, We're Going to Disneyland! I’m so excited! My wife and I recently made the last-minute decision to take our son to Disneyland for his fifth birthday . . . in six months. 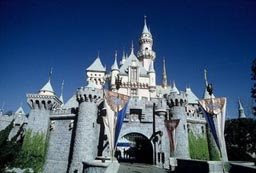 I’m a Disneyland fanatic, which is why deciding to go to Disneyland with such “short notice” is a bit gutsy on my part. To explain: I like to be well prepared before going to my favorite amusement park so I can take in all the sights and sounds to be had. I don’t want to miss anything. And I’ve been guiding my son toward this neurotic state of being from the day he was born. Since deciding to go to Disneyland, he and I have been playing “Disneyland” all over the house. To explain: I have the six-disk “Musical History of Disneyland” collection, which contains recordings of entire Disneyland attractions, such as “Pirates of the Caribbean,” “The Haunted Mansion,” and “It’s A Small World” that aid in re-creating Disneyland attractions at home. This will help to prepare us for what we’ll experience at the park. My son and I turned the bathtub into the tropical rivers of the “Jungle Cruise,” complete with shrubbery from the backyard, fake snakes and hippos, toy boats and, of course, a soundtrack from the actual ride. I also searched the Internet and found the written spiel that the “Jungle Cruise” tour guides actually use on the ride -- so I could narrate just like a real tour guide. My wife came home from work on the day we played “Jungle Cruise” and went into a panic at the front door. I didn’t have a chance to say a word before she discovered why the garden hose had been run from the outside faucet into the house. I had it dangling over the shower door, dumping water into the bathtub where our little “Jungle Cruise” boats floated along. You can’t go on the “Jungle Cruise” without seeing the Schweitzer Falls waterfall. Even a drive in the car isn’t complete unless it’s themed. And my wife knew this when she asked if I was going to drive like J. Thaddeus Toad from “Mr. Toad’s Wild Ride,” one of my favorite attractions in Fantasyland. As part of our preparations, my son and I reviewed Disneyland books and brochures, and I made us Monte Cristo sandwiches -- like the ones I love to eat at the New Orleans Square Blue Bayou restaurant. We’ve even been watching other people’s home video footage of entire Disneyland attractions at YouTube.com. Yes, my son and I have already laid a lot of groundwork for our trip. But we still have six months to wait, and a lot more to go over. Yesterday, my son asked us if my wife and I could take him to Chuck E. Cheese’s instead of Disneyland for his birthday. I was mortified. I looked for some support from my wife. “Well, it’s his birthday,” she said. “Yeah, but he doesn’t really want to go to a pizza place instead of Disneyland,” I responded. “Yes I do,” my son said. Eventually, my wife suggested we go to Chuck E. Cheese’s for my son’s birthday. “You’re on his side,” I exclaimed. “Oh, Okay,” I said, a little embarrassed. My wife had a great idea for a compromise. But I have a new dilemma: less time to prepare for Disneyland. Thats such a cute article! I love that in the end the compromise is to go for YOUR birthday! At least this way you get to enjoy both Chuck E Cheese and Disneyland, all in one year - added bonus!